Gears of War 4 now takes up over 100GB of storage on PC, a huge increase over the game's original size of 80GB. Read more on Gears of War 4's increased PC system requirements. Moving forward games will need to get more modular, especially if games continue to explode in terms of storage requirements. Hopefully, Microsoft and other game developers and distributors will keep this in mind as large games are released in the future. I completely and whole-heartidly disagree, storage space is as cheap as it's ever been. Better visuals need better textures, and better textures take up more space. Same with all things. When you get to the brass tax of it 100GB is nothing in today's storage standards. 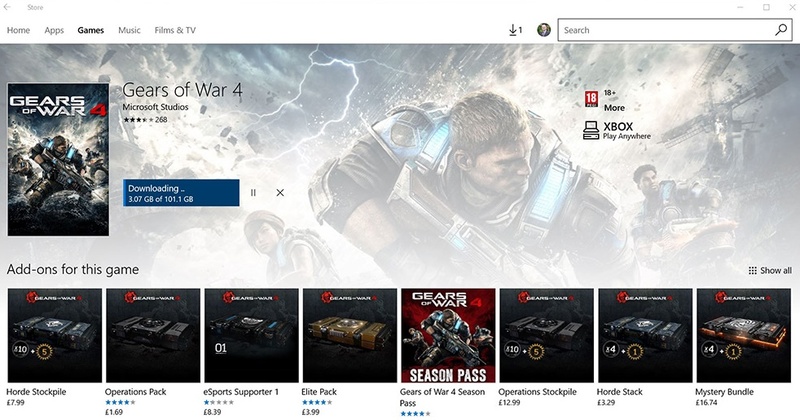 Wouldn't mind getting GoW4 but Microsofts pricing is a little insane considering it's been out for nearly 5 months now, £41.99 for the base game is a bit much.